Very good location. Need to walk to the beach, but a very short walk. Breakfast was great. Walking distance to a lot of restaurants, walmart an publix. Enjoyed our stay. Wonderful experience, customer service excellent, management decorate our room for our anniversary overall it was excellent also kitchen staff was great. Hotel is close to the beach they make it easy by shuttle so you don't have the walk with all your beach gear. The breakfast staff was very pleasant and accommodating they made my morning start of right. I will definitely visit again. Hotel was nice, comfortable, clean, convenient to the beach and area attractions, and very affordable. This hotel was a great find. It was clean, a few minutes from the beach, and had a delicious breakfast in the morning. From the moment you walk thru for registration through final checkout, business travelers will like the professionalism and "feel" of the Fairfield, Orange Beach. While Orange Beach is full of vacation spots, and the local staffs are very accustomed to the clientele, business travelers expect something different. You will not find a lazy river, walk out beach, $18 omelette, or "house drink" here - what you will find is what you do across the brand - professionalism and comfort. If you like walking across a 4 lane street. the shuttle only takes you to the curb. overall. we had a good time. we will stay there next year. Very convent, restaurants and shopping near by. Lovely pool and views. Only negative was our refrig. made a vibrating noise, which I fixed with a couple of folded napkins.The breakfast staff was really friendly and efficient. A really great start to our day. Will definitely be back. The rooms were nice and clean. The staff was helpful and friendly....breakfast was great! Nice overall. Only one negative was bathroom by pool was dirty and door wouldn't close well or look. Housekeeping staff were all very helpful and friendly! Thanks for a nice week. First time there and it was nice. Everything is in walking distance. This was a great anniversary trip. Great experience. Friendliest staff with the best attitude towards guests regardless of age. We stayed here and drove around the area. The weather turned rainy and cool so we did not spent much time at the beach. They have beach access that you need to walk to, not a problem for us, but others may not like crossing the road. FYI. There is a toll bridge in the area (few miles away) , easy to avoid, but if you do not know about it, it feels like they take advantage of the new travelers. I stayed there last summer and it was a lot better that time. This time I went for my birthday the room had marks on the walls, the fridge leaked water, the hot tub the first night had no water in it to relax there were so many kids in the pool area I never got a chance to use it. The fact that after 10 no one can use the pool area is ridiculous for those who don't have kids and would like to relax especially if we are quite it's not like there is a lifeguard on duty. From this experience I will not be staying there next summer was very disappointed this time. Very nice check-in. Easy. Great location. Was there with my golf team for a tournament and will stay here again. Our stay at the hotel was very enjoyable. Clean, update, rooms with breakfast included. They offer a great January - March, monthly deal for snow birds. I had a great experience, the pool was fantastic, the breakfast and service was good. the room was comfortable and clean. Had hairdryer, iron board and iron which was great. we enjoyed our stay would return again. surrounded by stores and eating place nearby. Located within a mile (2 km) of Adventure Island, Fairfield Inn & Suites by Marriott Orange Beach is within 2 miles (3 km) of Orange Beach Indian and Sea Museum. This 116-room resort welcomes guests with free breakfast and conveniences like an outdoor pool and free in-room WiFi. Free hot/cold buffet breakfast is served each morning from 6:30 AM to 9:30 AM. A flat-screen TV comes with cable channels, and guests can stay connected with free WiFi and wired Internet. Along with relaxing touches like a rainfall showerhead and a soaking tub, the bathroom offers hair dryers and free toiletries. Other standard amenities include a sofa bed, a refrigerator, and a microwave. 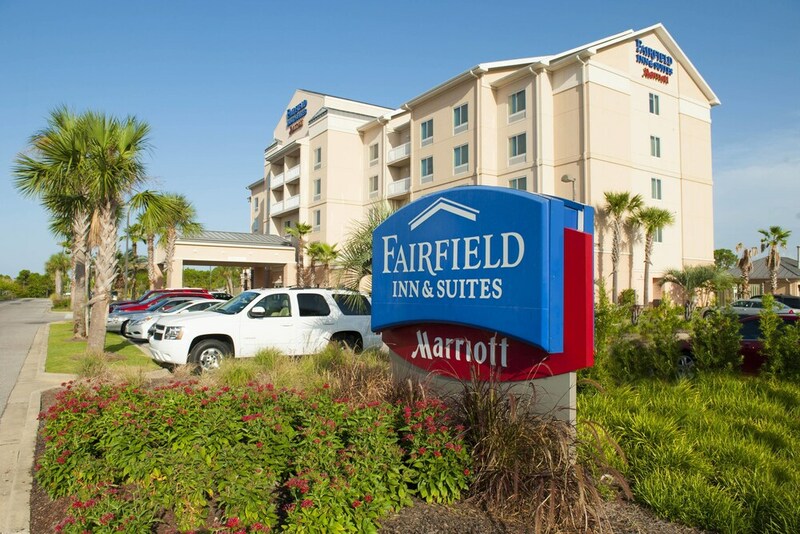 Guests staying at Fairfield Inn & Suites by Marriott Orange Beach enjoy an outdoor pool, a fitness center, and a spa tub. If you plan to drive, free parking is available. The 24-hour front desk has staff standing by to help with securing valuables and dry cleaning/laundry. Additional amenities include free WiFi in public areas, a 24-hour business center, and coffee/tea in a common area. Thank you for your valuable feedback and nice comments. We appreciate your return business and look forward to welcoming you again soon! Thank you for your valuable feedback. What could we have done better to earn a "5 Out Of 5" score? Your reply will help us improve service and quality. Thank you for your business and hope to have another opportunity the next time your travels bring you back to the Orange Beach area. Thank you for ranking us with all 5's!! Thank you for your positive feedback. We appreciate your business and look forward to welcoming you again soon. Thank you for your positive feedback and thank you for your business. We will be sure to share this with our staff. Free hot/cold buffet breakfast is served daily from 6:30 AM to 9:30 AM. The resort has an outdoor pool and a spa tub. Other recreation options include a fitness center. The preferred airport is Pensacola, FL (PNS-Pensacola Intl. ): 56-min drive, 31.9 mi/51.3 km. Guest checking in must provide goverment-issued proof of identity matching reservation name.